As the winter chill wears on, spice lovers in search of something hot can pick up some piquant products to tantalise their taste buds in Moscow. While Russia is not known for its sweat-inducing cuisine, the influx of restaurants from Asia means that there are some budget boutiques available to provide you exotic flavours. The taste of the Taj Mahal is tough to find in Moscow, but the Sevastopolsky hotel at Sevastoplskaya in the South of the city sells stuff straight out of the sub-continent. 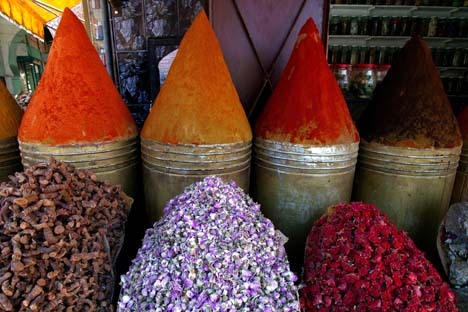 The Indian shop sells spices, oriental souvenirs, national costumes and jewelry. Put K Sebe (Path to Yourself) and Beliye Oblaka (White Clouds) sell similar goods, but tend to be slightly pricier. You can also say “namaste” – a common Indian greeting – to one of two shops called Indian Spices on Sretenka, near Prospekt Mira, and Miklukho-Maklaya, near Belyayevo metro. They sell lots of goods traditionally associated with India, from incense and exotic fruit preserves to rare oils, pickles and chutneys. They also sell products from Japan, Thailand, China and Mexico. The Indian restaurant Djaganat – located near Kuznetsky Most – has a store of national products, but ingredients there tend to be slightly more expensive. Chinese food is slightly easier to find,especially at the All-Russian Exhibition Centre – or VVTs, near VDNKh metro station – where various national pavilions stock a range of ethnic products. In the Chinese pavilion, number 14, rice, noodles, sauces and other goods can be used to whip up traditional dishes, while there is an extensive oriental tea collection to complement the meal. Sushi lovers can find the products to say sayonara to overpriced oriental restaurants and wrap their rolls at home. The owners of the Yakitoria chain of sushi bars opened a shop selling Japanese products near their restaurant on Novoslobodskaya 10 years ago. It has all the ingredients to make sushi – fish, nore algae, sauces, spices and various sorts of rice. The Djapro shop on Prospekt Mira is another place to get fresh fish and other seafood for sushi. It also offers other soy products, miso soup, Japanese mushrooms and sake. A wide range of exotic fruits and spices are available at Moscow’s markets. The largest of these are Danilovsky and Dorgomilovsky, which are often visited by professional chefs. There are also the high end supermarkets, such as Azbuka Vkusa and Globus Gourment, as well as Hediard at Barrikardnaya. Exotic ingredients at these stores will tend to set you back more than at the smaller shops, but it is worth popping in for delicacy cheese and seasoned wine.